Adjective; "of or relating to emeralds". Since many readers were fascinated by the story of Miriam's emerald doublet, I am "doubling back" to emeralds, this time, as whole stones. 1. Emeralds are included; the swirls, bits and bubbles you see in their depths are called the "garden" of the stone, and are not considered faults. You can see these without any magnification. Avoid black inclusions, either as lines or specks, and stones with an evident fissure on the surface. Brazilian emeralds look different from Zambian and Columbian emeralds; emeralds also come from other countries, but those are the big three. 2. They are typically treated with oil to improve the clarity, or resin to fill tiny fractures. Oiling is deemed acceptable, while the use of coloured resins is not. That's why you will want to buy an emerald from a reputable jeweller, and for large stones, get a GIA or other well-recognized certificate. These three elements of colour are important factors when you shop for any coloured gem; this graphic is part of an excellent GIA tutorial on coloured gems. Taylor's emeralds were classic grande-dame stunners, but today's stones take grande into latte-land; you can wear them every day. Left: Oui emerald (4mmx3mm) and black enamel pendant by Nikos Koulis: just a little dash of green on a white gold chain; price, $1,736 at Twist. Centre: Judy Geib is the reigning Emerald Queen, using them often in her fanciful, mismatched designs. The Casino Royale Earrings contain 6mm x 7mm cabochon-cut emeralds set in 18k yellow gold; price, $1, 300. 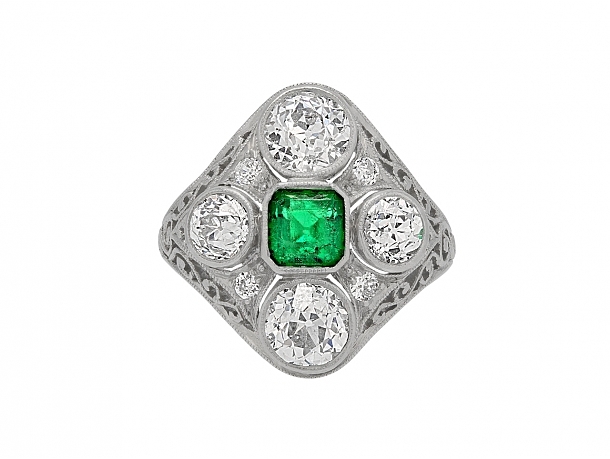 Right: Mociun Capella Stone Cluster ring uses asymmetrical black and white diamonds to frame a 4mm emerald; price, $2, 500. An especially cool way to wear emeralds is as a single earring, alone or mated with another earring. Just make sure those small stones are vivid. 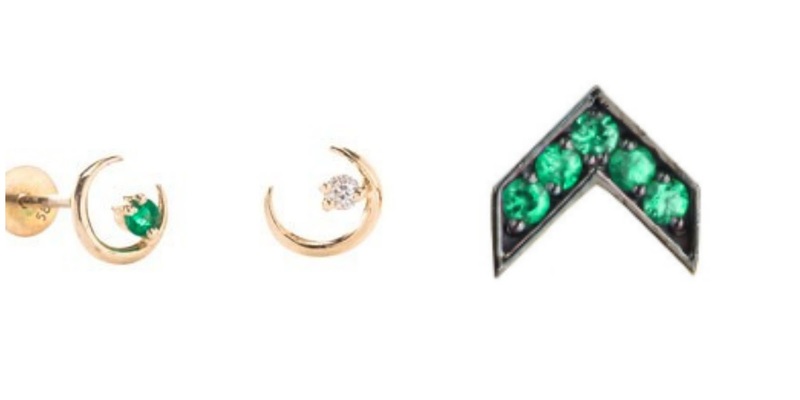 Left: Mocion make a tiny 2mm emerald Moonray Stud set in 14k gold for a reasonable $US 185. Also shown, white diamond, and available in black diamond, too. Right: Single chevron stud, by Ambre Victoria; price, $534 at Broken English. 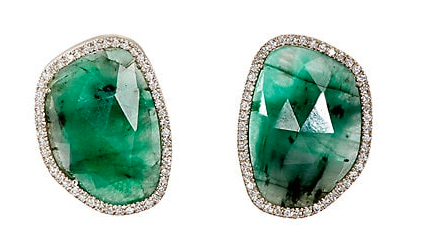 Emerald jewellery is also being made in interesting cuts, such as the rose-cut emerald slices in Monique Péan's earrings, which also feature conflict-free diamonds; at Barney's; price, $9, 800. A vintage emerald may show some signs of wear, especially abrasion on exposed settings. 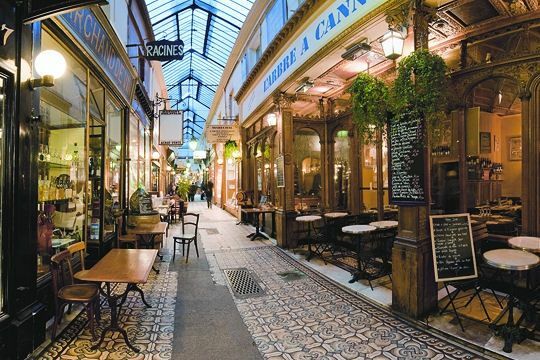 It can be revived in the hands of an experienced jeweller or cutter. 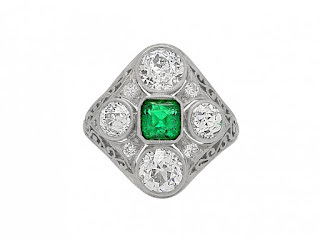 If you have a vintage emerald that looks dull, look for a specialist in restoration. Re-oiling will improve the colour; repolishing erases years of wear. Damaged stones can usually be recut, but perhaps not to the same shape. For more info about the restoration and repair of coloured stones, and what skilled cutter can do, see The Gem Doctor, Vancouver-based Anthony Lloyd-Rees' site. 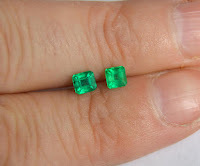 Here is a terrific post by Cecile Raley of Cecile Raley Designs, who describes the before/after oiling of a pair of round emeralds, with photos. See also her Etsy shop, yvonneraley, for both finished jewellery and loose stones. For example, on the Etsy site, Ms Raley sold this lively pair of 3.5mm emeralds for about $US 350; a simple setting in gold would add several hundred dollars. When buying any of the Big Four precious gems (diamond, sapphire, ruby, emerald), deal with a jeweller or gemologist, rather than a department store salesperson. When a jeweller promises to make you something with emeralds, be aware that certain settings put high pressure on a stone, and you are just asking for problems down a pavéd road. A piece should be designed with eventual repair in mind. 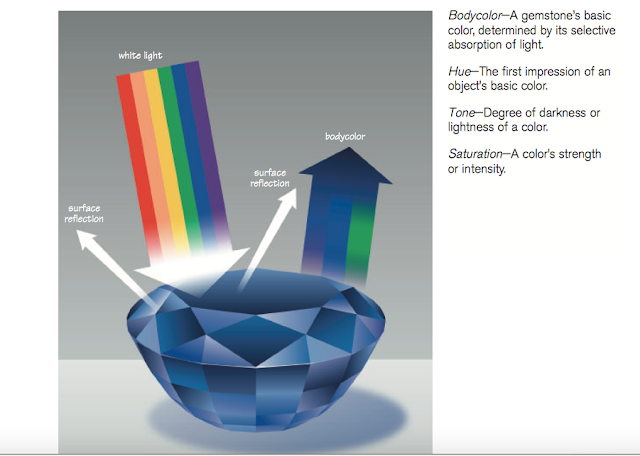 If you're thinking of having an emerald (or any coloured gem) custom-made or reset, here's valuable advice, "Coloured Gemstone Design and Repair", by Suzanne Wade, retrieved from Ganoskin.com. Don't shy away from the gorgeous emerald, just give them a little love and respect. Though jewellers can offer other other green stones that do not require so much tending, nothing else provides such plush, glowy, velvety depth, and if you're a Nugget Girl, emerald comes in big sizes. Taylor was famous for her collection of jaw-dropping emeralds, which you can see here. I saved them for last, because I don't want you to think of emeralds as ballgown stones. The casual pieces in the Passage's windows today were made for versatility. But you do feel different in an emerald, even a tiny one. 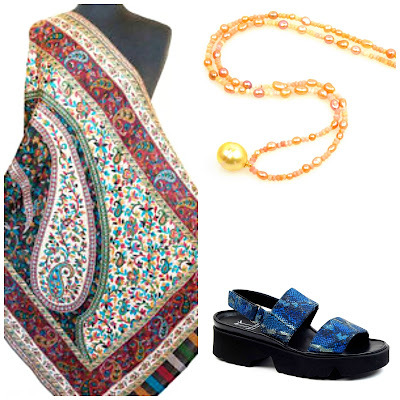 Nothing wrong with a dash of mystique at the market! I've never been tempted by a faceted jewel before, but I have to admit that the idea of a tiny emerald earring has turned my head! Thanks for the information and the links! Natural black diamonds are translucent, and the irradiated ones are black-black. They are useful mostly because of their durability. 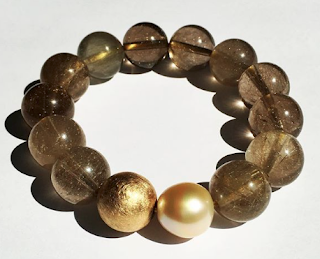 Janice: Faceted stones are lively,because they are cut to return light (disperson). But I like non-faceted cuts, too. 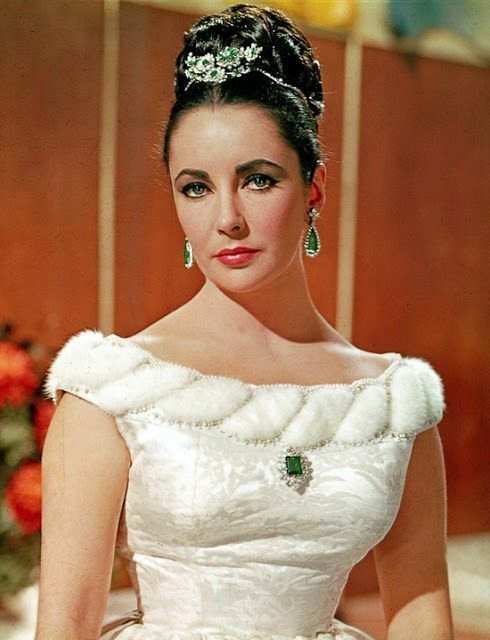 I was lucky enough to see some of Elizabeth Taylor's emeralds at the Van Cleef & Arpels exhibit last year. They were GLORIOUS. Sue: You did!? I probably would have needed resuscitation. I am jealous. Love that you show the power of smaller stones, those moon Ray earrings are very appealing. i appreciate being able to learn and admire, you're such a good writer.